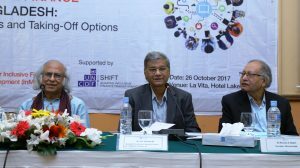 On 26 October 2017, Institute for Inclusive Finance and Development (InM) organised a round table discussion on ‘Interoperability of Digital Finance in Bangladesh: Challenges and Taking-off Options’, supported by UNCDF-SHIFT (Shaping Inclusive Finance Transformations) at Lakeshore Hotel in Dhaka. The State Minister for Finance and Planning, Mr. M. A. Mannan MP was present as the Chief Guest while Mr. Arijit Chowdhury, Additional Secretary, Financial Institutions Division, Ministry of Finance, and Mr. Subhankar Saha, Executive Director of Bangladesh Bank, were present as special guests. Dr. Lila Rashid, General Manager of Payment Systems Department, Bangladesh Bank was the designated discussant. Dr. Mustafa K Mujeri, Executive Director of InM, presented the Keynote Paper on the occasion. The discussion session was chaired by Dr. Qazi Kholiquzzaman Ahmad, Chairman of InM. Honorable State Minister, Mr. M. A. Mannan MP observed that interoperability of digital financial services (DFS) would increase client benefits, facilitate competition based on product innovation and diversification, and boost the growth of digital finance ecosystem in Bangladesh. It would accelerate digital financial inclusion and complement Bangladesh government’s actions for digital transformation of the key sectors of the economy to achieve the goals of ‘Vision 2021’. He emphasised that It was time for Bangladesh to develop the digital finance ecosystem such that interoperability could be ensured through designing a comprehensive framework. The speakers in the dialogue emphasised that Bangladesh had successfully promoted new innovations for promoting financial services to the low income groups, especially rural poor, women and small businesses. Rapid growth in adoption and active usage of digital financial services in Bangladesh started especially since 2012. Mobile financial inclusion has shown the promise of emerging as the most viable way of accessing financial services for the previously unbanked population. The regulators and private sectors need to respond to emerging issues related to DFS like interoperability, USSD pricing, e-KYC (electronic Know Your Customer), required regulatory reforms, innovation in product development targeting the low income groups etc. Interoperability brings benefits to consumers, mobile money providers, and agents through increased convenience, cost savings, a greater choice of providers and better liquidity management for agents. Further, interoperability is also relevant to several issues of competition e.g. reduction in network effects that restrict consumers’ freedom to switch based on quality of service and price; improved user experience and ease of account usage in across-provider transfers; reduction in agent exclusivity as agents can function for multiple mobile financial services (MFS) providers; increasing diversity of MFS options for consumers; and access to MFS channels from third-parties such that MFS originating in one MFS network can land on another MFS network. The roundtable discussions further observed that DFS ecosystem needed a comprehensive design, stakeholders’ buy-in and action plan for developing the infrastructure, regulatory frameworks and taking the agenda forward. The digital finance interoperability would enable different payment infrastructures and financial service providers to effect payments between customers. Through the mechanism, interoperability would expand the reach of transaction accounts and retail payment instruments, making them more useful for end-users. Bangladesh Bank has successfully introduced national payment switch, a robust payment infrastructure and actively promoting interoperability among banks and financial institutions. Drawing from those experiences, now the key regulator of financial sector expects to introduce digital finance interoperability by June 2018. Concerned departments of Bangladesh Bank are working to initiate a consultative process with service providers and outline the action plan for implementation. Bangladesh Bank is confident to achieve intended objectives within the targeted timeline, observe Mr. Saha and Dr. Rashid from the Bangladesh Bank.